Production: Les Films La Boétie and Cinégay; Eastmancolor (print by Deluxe), 35mm; running time: 105 minutes, English version: 98 minutes; length: 2900 meters. Released January 1969, Paris. Filmed 1968 in and around Paris. Producer: André Génovès and Georges Casati; screenplay: Claude Chabrol; photography: Jean Rabier; editor: Jacques Gaillard; sound: Guy Chichignoud; art director: Guy Littaye; music: Pierre Jansen; music conductors: André Girard and Dominique Zardi; costume designer: Maurice Albray. Cast: Stéphane Audran ( Hélène Desvallées ); Michel Bouquet ( Charles Desvallées ); Maurice Ronet ( Victor Pegala ); Serge Bento ( Bignon ); Michel Duchaussoy (Police officer ); Guy Marly ( Police Officer Gobert ); Stéphane Di Napoli ( Michel Desvallées ); Louise Chevalier ( Maid ); Louise Rioton ( Mother-in-Law ); Henri Mateau ( Paul ); François Moro-Giafferi ( Frédéric ); Dominque Zardi ( Truck driver ); Michel Charrel ( Policeman ); Henri Attal ( Man in cafe ); Jean-Marie Arnoux ( False witness ); Donatella Turri ( Brigitte ). Chabrol, Claude, " La femme infidèle ," in Avant-Scène du Cinéma (Paris), May 1969. Wood, Robin, and Michael Walker, Claude Chabrol , New York, 1970. Fassbinder, Rainer Werner, and others, Reihe Film 5: Claude Chabrol , Munich, 1975. Armes, Roy, French Cinema Since 1946: The Personal Style , New York, 1976. Blanchet, Christian, Claude Chabrol , Paris, 1989. Austin, Guy, Claude Chabrol: Autoportrait, Manchester, 1999. Comolli, Jean-Louis, in Cahiers du Cinéma (Paris), February 1969. Baxter, Brian, "Claude Chabrol," in Film (London), Spring 1969. "Chabrol Issue," of Avant-Scène du Cinéma (Paris), May 1969. Dewey, Langdon, "Chabrol Rides the Waves," in Film (London), Summer 1969. Millar, Gavin, in Sight and Sound (London), Autumn 1969. Gow, Gordon, in Films and Filming (London), October 1969. Sarris, Andrew, in Village Voice (New York), 13 November 1969. Wood, Robin, in Movie (London), Winter 1969–70. Allen, Don, "Claude Chabrol," in Screen (London), February 1970. Milne, Tom, "Chabrol's Schizophrenic Spider," in Sight and Sound (London), Spring 1970. Kernan, Margot, in Film Quarterly (Berkeley), Summer 1970. "An Interview with Claude Chabrol," in Take One (Montreal), September-October 1970. Legrand, Gérard, Michel Ciment, and J. Torok, "Interview with Chabrol," in Movie (London), Winter 1970–71. Nogueira, R., and N. Zalaffi, "Conversation with Claude Chabrol," in Sight and Sound (London), Winter 1970–71. Haskell, Molly, "The Films of Chabrol—A Priest among Clowns," in Village Voice (New York), 12 November 1970. Ebert, Roger, "This Man Must Commit Murder," in New York Times Biography Edition , 29 November 1970. Harcourt, P., in Film Comment (New York), November-Decem-ber 1976. Anderson, S., "True Love and the Bourgeoisie," in Filament (Day-ton), no. 2, 1982. Dennis, J., "Hitchcockian Influences on Claude Chabrol," in Filament (Dayton), no. 2, 1982. Jousse, T., and others, "Entretien avec Claude Chabrol," in Cahiers du Cinéma (Paris), no. 437, November 1990. Berthomieu, P., and others, "Entretien avec Claude Chabrol," in Positif (Paris), September 1995. Feinstein, H., "Killer Instincts," in Village Voice (New York), 24 December 1996. Magny, J., "Questions de mise en scene," in Cahiers du Cinéma (Paris), Hors-serie, 1997. Claude Chabrol's La femme infidèle is perhaps the director's most characteristic film: an extraordinarily spare thriller emphasizing the subtle psychologies of its few major characters. Although the film presents Chabrol's typical triangle—Charles and his wife, Hélène, who has taken a lover—the members of the triangle never all come together; and the film is organized very formally; one scene between Hélène and her lover, one scene between Charles and her lover, and many scenes between Hélène and Charles. The film is almost completely subtext; although the film's primary subject is the relationship between Charles and Hélène (and the sociopolitical implications of its failings), not one word ever passes between Charles and Hélène about her love affair or the problems of their marriage. The indirectness of the film seems apposite, since Chabrol indicates that the violence which erupts so suddenly in the film is repressed beneath the apparently civilized surface of bourgeois society. Chabrol emphasizes those surfaces: the beautiful greens of the couple's landscaped garden, the shine on the silverware, the bouquets of flowers, the informal family grouping outdoors which is masked by a cheery blue canopy. True to his manner, Chabrol entirely eschews sentiment, and yet—although apparently cold and distant—condemns no one. If this witty, ironic film holds neither Hélène nor Charles completely responsible for her affair, it credits the act of violence the affair precipitates for the rekindling of the couple's passions for each other, as each suddenly sees the other in a new light. By the end of the film, Hélène is all too willing to cover up her husband's crime and lovingly accept the kind of transference of guilt typical of the Hitchcock films Chabrol so obviously admires. There are very few emotional outbursts or expressions of feeling in the film; the murder of Hélène's lover, which comes unexpectedly; three choked sobs that Hélène gives when she discovers her lover has been killed; and one truly heartfelt embrace between husband and wife. Rather, the emotion, as repressed as the natural instincts of the characters, is displaced instead onto the decor; indeed, there are flashes of red throughout—Hélène's earrings, a bedroom wall, a beauty shop awning, a bright dress, a lampshade, a cabinet, and so forth. As usual for Chabrol, objects are consistently used as symbols; a white, aloof statue that Charles tries to cleanse of red blood and which stands, perhaps, for Hélène; a huge cigarette lighter, which represents the passion Hélène has transferred from her husband to her lover; and the jigsaw puzzle, put together by the couple's son, which seems to represent their marriage and/or the narrative. The cinematography by Jean Rabier and the score by Pierre Jansen are impeccable and provocative. 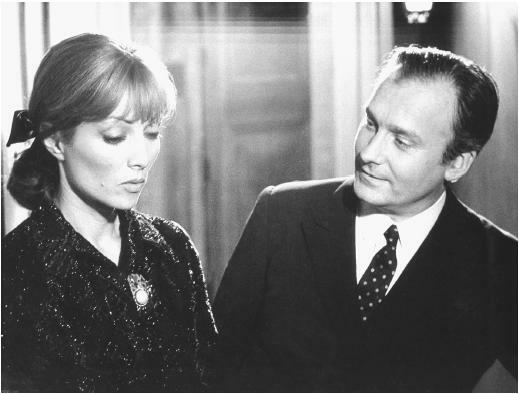 So too are the performances, especially by Chabrol's wife, Stéphane Audran, as Hélène (note the cool expressiveness of her beauty as she descends the stairs at the end of the film), and Michel Bouquet as Charles. A small but perfect film, La femme infidèle represents only one variation on the theme in a series of films directed by Chabrol in the late 1960s and 1970s in collaboration with Audran, Rabier, and Jansen.